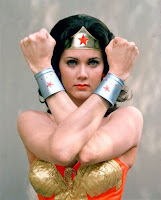 Oh man, I loved Lynda Carter's "Wonder Woman." She was one Amazon of an actress. But somehow I managed to miss this amazing clip. Note how she spins around and conjures up a helmet before jumping on the skateboard. The Metafilter comments are priceless. One says "Oh and when VCRs became common and we got to fool around with them, rumor was that if you freeze-framed Lynda Carter spinning into her Wonder Woman costume at just the right moment you would see her completely naked." Were you a "Wonder Woman" fan?